Rock Steady Boxing provides a way for those with Parkinson’s to come together, happily, and literally fight our way to better health. We learn to keep our hands up and our feet moving. Pushing myself physically during class brings about flexibility, agility, balance and stamina…. qualities I once thought incompatible with the disease… I am so fortunate and privileged to be a part of this miraculous program, which has changed my life and the lives of others. 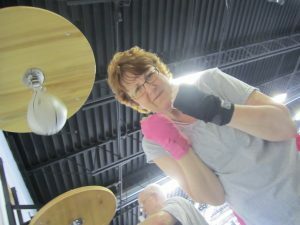 Rock Steady Boxing provides the arena for me and increasing numbers of fellow “Parkies” to lead fuller, more independent lives.